Over the years, our business has changed. When we first traded in 1984, the sunroof market was very much installation based. But these days, its very much a split between fitting and repairing sunroofs. The type of repair is individual to each type of vehicle. From a straight forward reseal on a Renault Clio to a service exchange sunroof on a Rover 25. We are happy to answer any questions you may have, regarding your particular needs. You can bring your car to us, or we can travel to you. We cover the entire South West. If you bring the car to us, the work is usually carried out while you wait. Unless you wish to leave the car with us. 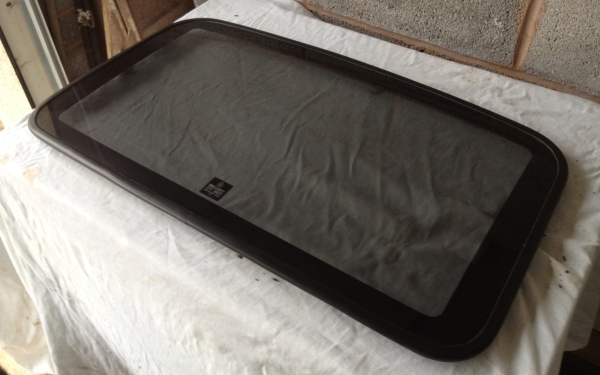 Above is a Rover200/25/MGZR sunroof panel before repair. Above is the underside view of the same Rover sunroof panel. This is what you cant usually see until the panel is removed. This rust will be ground away to reveal clean metal, then primed and painted in a rust preventing paint. This is the re-conditioned glass panel. Complete with new seal. Once fitted, we guarantee the work for 1 year. Total cost, including local travel £185.00.